Michael Chaney is a businessman and the current chancellor of the University of Western Australia. His father, Sir Fred Chaney, was a minister in the Menzies government and his brother, Fred Chaney, is a former deputy Liberal leader. Among other current positions, Chaney is chairman of Woodside Petroleum Limited and chairman of Wesfarmers Limited, where he was managing director from 1992 to 2005. 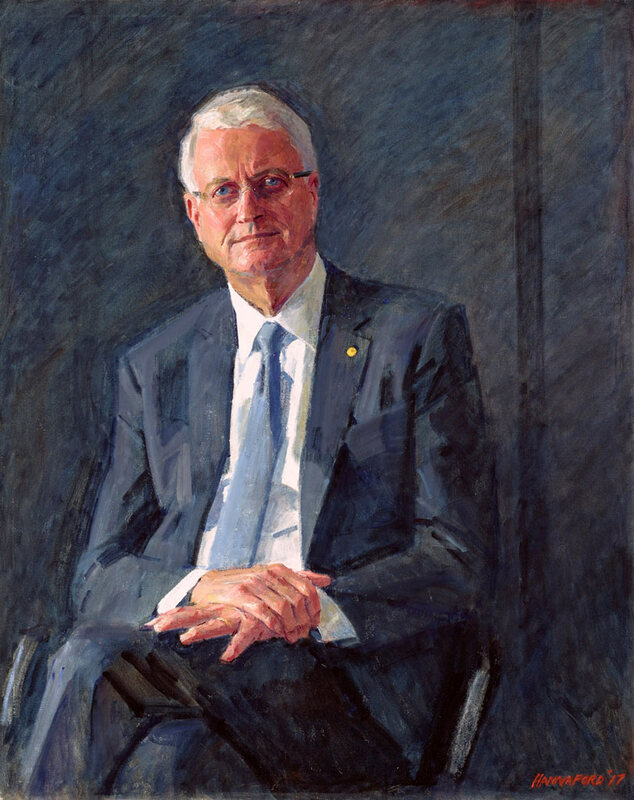 He was appointed an officer in the Order of Australia in 2004 for service to the business sector, and to the community through his support for a broad range of artistic, cultural and scientific organisations. Robert Hannaford was commissioned to paint Chaney’s portrait by Woodside Petroleum. It was painted in Perth in seven sittings over the course of a week. ‘He was a very charming man. We got to know each other quite well. He invited me and my wife Alison to dinner at his house – it was one of the more enjoyable portrait commissions,’ says Hannaford. Born in 1944, Hannaford lives and works near Riverton, South Australia. He has been a finalist in the Wynne and Sulman Prizes and won the Doug Moran National Portrait Prize in 1990. An Archibald finalist on 19 previous occasions, he has won the People’s Choice three times.